ack45 wrote: 1:nobody knows, its like that pink stuff you put on sushi. 3:he now resides in my DS's flashcart frantically trying to grow beyond the 8gb I have allowed his existance to continue within. 6:there were no s'pht'kr in that level. The s'pht'kr are a lie. 7:thats not the last level. its a detour due to construction. 8:eliza. she's still in counselling because of it. 11:because I keep him backed up in my mp3 player. stop beating that long dead horse. Last edited by logan on Dec 9th '08, 22:02, edited 1 time in total. Ok, umm, SPNK me if I'm wrong, but didn't Bungie refer to Rubicon as Marathon 4, back before A1 was programmed? I know other fans sometimes consider(ed) it Marathon 4, but I remember nothing of Bungie saying this. Do you remember where you might have heard it? Edit: I personally remember e-mails posted on the old Rubicon site to the effect that "Rubicon is so good, I think of it as Marathon 4, especially now that BUNGIE LEFT US FOR MICROSOFT!!!!!!!!!!" but that's about it. Edit 2: Here's an archived copy of the page I talked about. Searching it for "Marathon 4" brings up several relevant messages (although I don't think any of these accuse Bungie of selling out! oops). Does any of that look familiar? Last edited by irons on Sep 19th '09, 03:25, edited 1 time in total. Pfhorrest wrote: Eternal also has small references to RED in it; the W'rkncacnter at Lh'owon speaks to you in a failure timeline in Chapter 3, using the same style of broken speech as the W'rkncacnter from RED. I once considered having the Flood-like enemies I wanted for Chapter 5 be the Organics from RED, but decided against that for some reason I don't now recall, to use PiD monsters instead. Now THAT would have taken me by surprise more than the PID monsters did. I'm a strong fan of Marathon: RED. But Organics in Marathon Eternal would have just been weird. Not to mention people would probably stop playing the game simply out of they're "principles". MoppyPuppy wrote: I'm a strong fan of Marathon: RED. But Organics in Marathon Eternal would have just been weird. and not to mention the fact the organics came from the EARTH'S w'rkncacnter (Joshua I think), not this other one. Wait... so did the PiD monsters... uh... nevermind. VikingBoyBilly wrote: and not to mention the fact the organics came from the EARTH'S w'rkncacnter (Joshua I think), not this other one. Wait... so did the PiD monsters... uh... nevermind. Also, didn't both W'rk in RED come from Lh'owon's sun? Last edited by Pfhorrest on Feb 7th '10, 00:01, edited 1 time in total. I have a Mac Format CD somewhere that came with the marathon trilogy for free, just after it was made freeware, it also came with Eternal and described it as "The Unofficial Sequal to Marathon Infinity", but that could just be Mac Format trying to get people to buy the magazine for the CD. 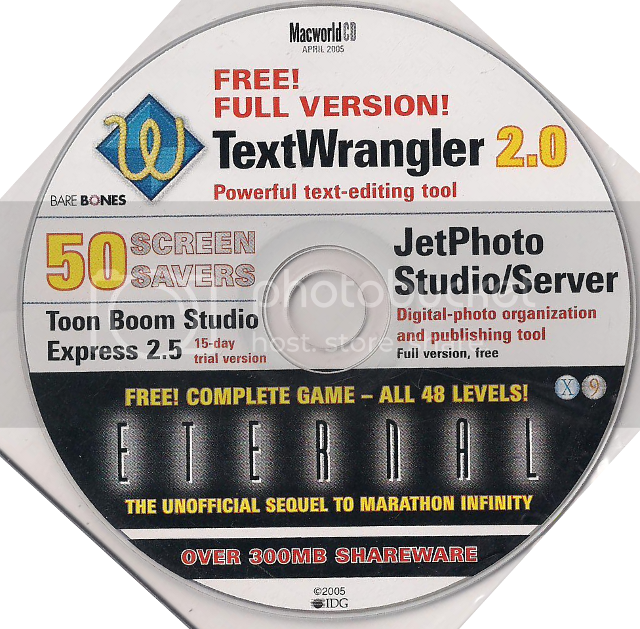 It was Macworld, not Mac Format, and it only came with Eternal, not the other marathon game. EDIT2: When talking about Marathon's story, it's best to keep Eternal out of it, but I find it interesting how it was marketted as the "unofficial sequel", the game must have been pretty good. Last edited by xilef on Feb 7th '10, 12:43, edited 1 time in total. ROFL -- "all 48 levels" -- that means they grabbed Mk V, which was, in point of fact, NOT a "complete game" as they say. Last edited by Pfhorrest on Feb 7th '10, 22:39, edited 1 time in total. Kinetic Turtle wrote: (although I read somewhere that Alex Seropian said something about the marine and the Master Chief being the same person, but that's unsubstantiated). I took this to mean that the MC was another incarnation/envisioning of the same archetype as the Security Officer, not that they were literally the same person. I love how far this as gone from a thread about how Eternal isn't canon to a history lesson about Infinity to a variety of jokes about the people that don't get Infinity. Did this thread forget to take its ADHD meds? I think it's okay for a thread that's six and a half years old to drift off-topic slightly. I don't care what anyone says (not even the author). Eternal will always be canon to me, unless Bungie come out with a new installment and totally blow it out of the park. It's just too good, it ties so much stuff together... And I love the way it shows (rather than tell) more of what goes on with the AIs. Especially Leela. In any case, the way they went with Infinity, almost anything can be integrated into the universe. It's a fanfic writer's dream. I think it's time for me to replay the four games again. EDIT: I just necro'd the thread after four years. This forum is a weird place. Johnman wrote: This forum is a weird place. That's not even the weirdest part. Also, you do realize that you're just asking for W'rk, irons and RyokoTK to turn on you, right? Johnman, I think something like 'preferred fan-sequel' would be a lot more useful in this context. Outright declaring a fan scenario 'canon' like this just leads to confusion. I don't care what anyone says (not even Johnman). Johnman will always be cancer to me, unless Bungie come out with a new Johnman and totally blows me in the dark. He's just so poop, he lies so much stuff forever... And I hate the way he shows (rather than tells) what goes in the a-eye. Especially Johnman's. In any case, almost anything can be integrated into Johnman. It's a frantic wiper's dream. I think it's time for me to replay the Pfhor games again because there's only three of them because ETERNAL IS NOT CANON IN THE MARATHON STORY. And yes, RADIX is right on this one - clarifying between "preferred sequel" (i.e. "head-canon") and outright canon is very important, especially in this community. For example, my preferred sequel is actually Rubicon X, though Eternal does make more sense in the context of Infinity - of course, neither one is truly canon, though they might feel like it. I'm genuinely curious what you think is the point of these posts? You're trying hard to start a fight, but it's really unclear why. Wrkncacnter! He's just about starving tonight! Come on, Wrk, give him just one roast. Well, he included me in the list as well, and I hadn't even posted in this thread by that point, as I never had any interest in this topic to begin with. It's pretty clear he's just listing people he doesn't like rather than basing it off of any sort of reality. It's been wonderful seeing these snapshots of Perseus' evolution from a naive bob into a naive bob with hairy knuckles.